Last week, we discussed what was on the CogAT Quantitative Battery and a few different activities that you can do to practice for it using things you likely already have around your house. This week, we will discuss two more activities you can do to help prepare for this section of the test. Number Analogies– These questions draw parallels to the picture analogies found on the verbal subtest. Instead of identifying relationships or links between verbal concepts, students are presented with quantitative measures. This section contains 14 questions. Number puzzles – Students are presented with a visual of 2 trains. Their task is to select the option that makes the second train carry the same number of objects as the first train. This section contains 10 questions and takes approximately 11 minutes to complete. Number Series – Each question displays an abacus with a bead pattern. Students must identify the pattern before choosing the string of beads that follow next in the sequence. This section consists of 14 questions and takes approximately 10 minutes to complete. Once they have created and solved the cards, ask them what the analogy is. The child should understand how the first two sets of numbers are related. They should then transfer that numerical trend to the set with the blank space. 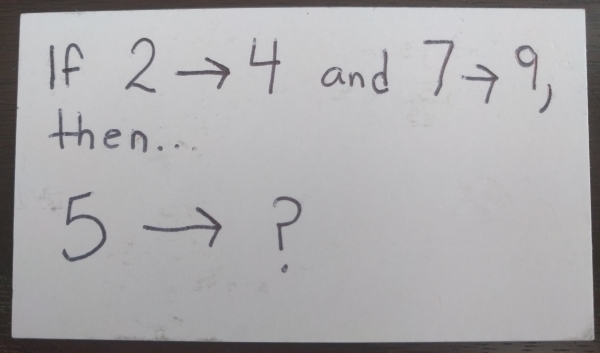 In this case, the answer would be 7, as each set demonstrates an increase by two. It is not only important that your child solve these problems, but that they have an understanding of how to generate them. Let them challenge you! Encourage them to create cards for you to solve! Let’s be honest. 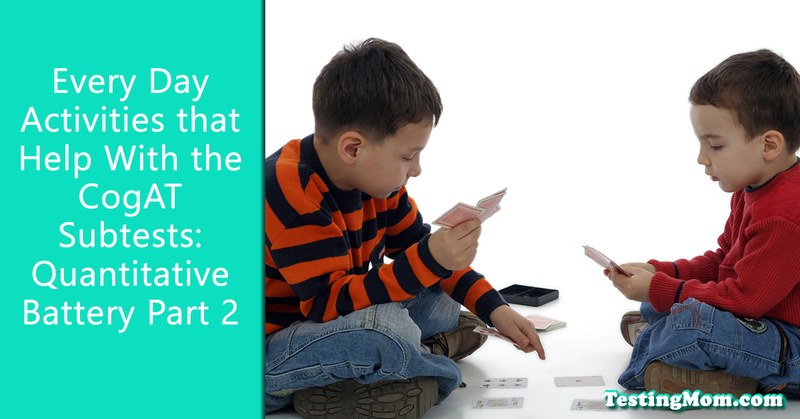 Card games not only provide us with a healthy dose of competition, but can be an amazing way to solidify math facts. Your child may not even realize that such games are helping them hone their quantitative skills. An excellent game for addition and even subtraction is called “Fast facts”. This game is best for two players. The only materials required is one deck of cards, with all of the aces removed. The instructions require that players deal out half of the cards between themselves and their parent/friend. Two piles should be placed facing down. Both players will choose the card on the top of their pile and lay it face up in the middle.The first player to call out the product of the two cards will win both cards. Players also have the option of doing the sums or differences between the cards (depending on what version of the game they play). If it is a draw the cards are left on the table. In this case, two more cards will be turned over. Whoever wins that round will pick up all the cards in the middle. The winner is determined by whichever player has the most cards! As you can see, there’s a lot to talk about when it comes to CogAT practice through everyday activities. These are only four things you can do to help practice for the quantitative portion.